John Chukwudi Utaka (born 8 January 1982) is a Nigerian football player, who currently plays for Portsmouth of the English Premier League. He is the brother of OB's Peter Utaka. He has played for several clubs across three continents, first for Arab Contractors and subsequently Ismaily of Egypt, then spending a season playing for Al-Sadd of Qatar, before joining Racing Lens and later Rennes in France. He now plays for Portsmouth in England, mainly as a pacy winger who is utilised for the team's counter attacking. He is the older brother of Peter Utaka, who plays for OB In Denmark. Utaka struggled to make an impact at the start of his Rennes stint. However, he took advantage of the absence of fellow striker Alexander Frei through injury to make his breakthrough. In February 2006, he scored two consecutive hat-tricks, against Lens and Lyon, and as a result received L'Equipe's player of the month award. In Egypt, while with Ismaily, Utaka earned cult status with the local fans. They used to chant "Oh Oh Oh Utaka, Oh Oh Oh Utaka" during the matches. He played alongside the likes of Mohammed Barakat, Islam El-Shater, and captain Mohamed Salah Abo Greisha under the guidance of Mohsen Saleh, later appointed coach of Egypt. 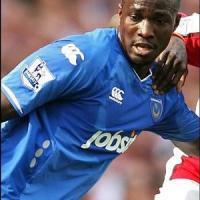 Utaka joined Portsmouth on a four-year deal in July 2007, for a fee of around £7,000,000. He scored his first goal on 11 August 2007 in a game against newly promoted Derby County. Some sources claim he became the club's record signing. On 17 May 2008, Portsmouth won the FA Cup with a 1–0 victory over Cardiff City. Utaka provided the cross for the winning goal which was scored by Nwankwo Kanu. He went on to have a poor 2008–09 season but on 27 June 2009 he confirmed he would be staying at the club for at least another season. On Saturday 16th January 2010 he was linked with a move to Celtic FC . The salary being paid to Utaka become a talking point in light of Portsmouth FC's financial woes. With news agencies reporting an alleged 80 thousand Sterling per week salary for Utaka a reflection of the financial mismanagement of the football club. Utaka has since hit out at these reports, claiming that he earns one third of that figure. On 23 January 2010, Utaka scored both goals in Portsmouth's 2–1 win over Sunderland in the FA Cup 4th Round. He plays for Nigeria and was a participant at the 2002 FIFA World Cup. He started four of Nigeria's six games in the 2006 African Cup of Nations, in which Nigeria finished in third place.